Since Murphy Battista’s formation over thirty years ago, our firm has taken an active role in helping our clients get their lives back on track in the wake of an accident. We understand that serious injuries carry significant consequences for individuals and their families that go far beyond the obvious physical challenges and money worries. 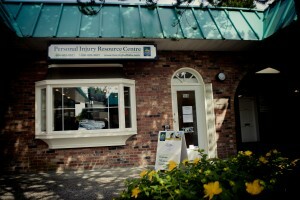 It is in this vein, that we decided to sponsor the brand new Personal Injury Resource Centre (“The Resource Centre”) located next to the G.F. Strong Rehabilitation Centre here in Vancouver. The Resource Centre is staffed by people who have been through the recovery process after a serious injury and, with the help of lawyers from our firm, provides free legal advice and other much-needed support to personal injury victims and their families. The PIRC is adjacent to the G.F. Strong Rehabilitation Centre. Our firm has established a proud tradition of providing free legal work to the community in order to give back to those around us. The Resource Centre is a logical extension of this tradition and will provide a space where we can hold periodic seminars on issues of interest to people with disabilities and provide free resources and legal advice to injury victims. The goal is to provide ongoing support to individuals when they need it most. Because it is a consumer driven resource, The Resource Centre makes sure to employ individuals that are professional, energetic and strive to exceed the expectations of our clients. The Resource Centre also intentionally employs people who have had spinal cord injuries. In our experience, these individuals are able to provide unique insights to injury victims as they learn to cope with the physical repercussions of their accidents. Because they have literally “been there”, Centre staff are able to assess the needs of clients at every stage of the recovery process and provide appropriate words of encouragement when they are most needed. The mission of The Resource Centre is to provide service to injury victims based on their specific needs. This means that The Resource Centre’s services can range from concrete goals, such as assistance with housing and job searches, to simply providing a place where injury victims can drop in for a chat. Big or small, The Resource Centre will attempt to find a solution to any issue. If The Resource Centre is unable to help an individual directly, then they will tap into an extensive network of resources to locate professionals that can provide the required assistance. The Resource Centre is located adjacent to the G.F. Strong Rehabilitation Clinic at 908 West King Edward Avenue, Vancouver, BC. Click here for Map. The Resource Centre is open afternoons, evenings and weekends. Hours of operation are arranged based on need and subject to change throughout the week. If you are injured or you are caring for someone who is, we hope you will take advantage of this community resource. If you are interested in accessing The Resource Centre’s services, you can call them at 604.683.9621 or toll free at 1.888.683.9621 for more information.